Jackson Holes Newest in Luxury - complete renovation Spring 2012. Experience the areas newest and most luxurious accommodations offering generous amenities stylish rustic decor and unsurpassed comfort. Each mini suite beckons for guests to unwind with presidential double pillow top mattresses complete with plush bedding linens and accents as well as a spacious sitting area featuring a sleeper sofa. The spacious bathrooms offer granite countertops plush robes and fine bath amenities. After a day of outdoor adventure in Jackson Hole we invite you to relax and experience the best in technology with a 52 inch LCD LED 3D television and Blu-ray player iHome alarm clock and a large desk with a built-in electronic hub ideal for any traveler. Hotel amenities include a new restaurant serving innovative cuisine a newly designed indoor-outdoor pool hot tub and sauna and a state-of-the art fitness center. We offer a complimentary gourmet breakfast to our guests each morning. The local town shuttle makes regular stops at The Lodge at Jackson Hole making getting around town easy and convenient. Dining and shopping in Jackson Hole are located nearby. This hotel is centrally located near Teton National Park Yellowstone National Park Jackson Hole Mountain Resort and Snake River. Great nearby recreational activities include fishing whitewater rafting hunting sightseeing at national parks hiking biking skiing snowmobiling and horseback riding. Find luxurious accommodations whether exploring Jackson Hole or the Grand Tetons at this hotel gem. 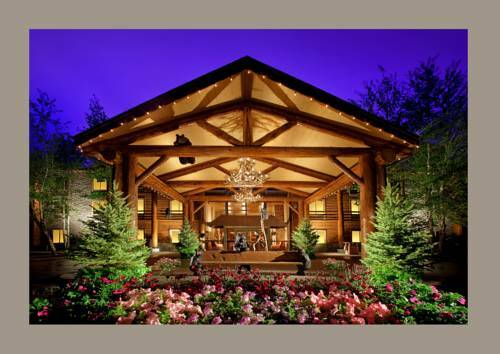 The Lodge at Jackson Hole located just minutes from Jacksons bustling Town Square and the surrounding parks.